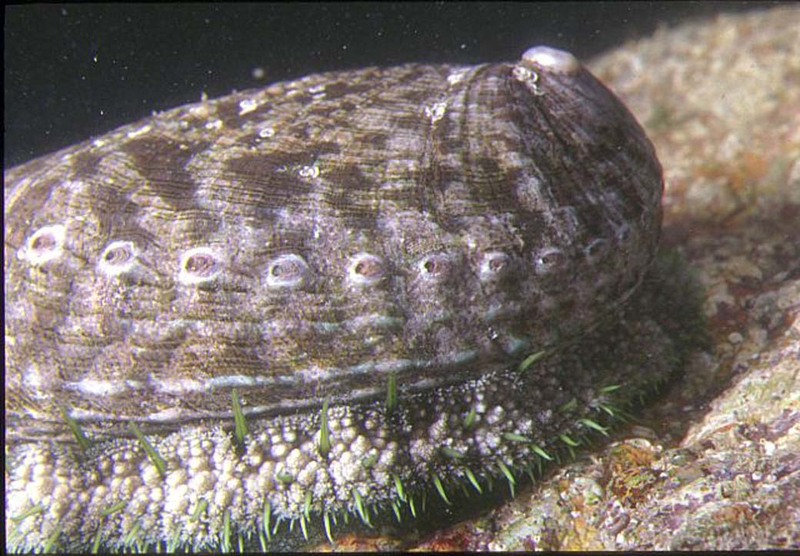 The Ormer is a single-shelled gastropod that crawls (limpet-like) over the rocks feeding on algae. It remains attached by a powerful green foot and shows a mantle of green. A curved line of round holes is distinctive and white parts of the mantle occasionally protrude from largest of these. 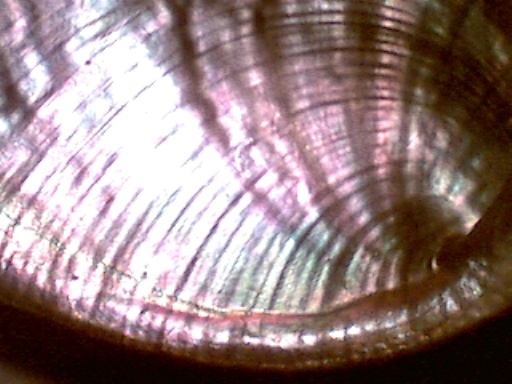 The interior of the shell is a smooth nacre ("Mother of Pearl"). The outside is rough usually a dirty green or brownish colour. Occasional specimens could be red. The frilly margin running around the perimeter of the shell is called the epipodium. 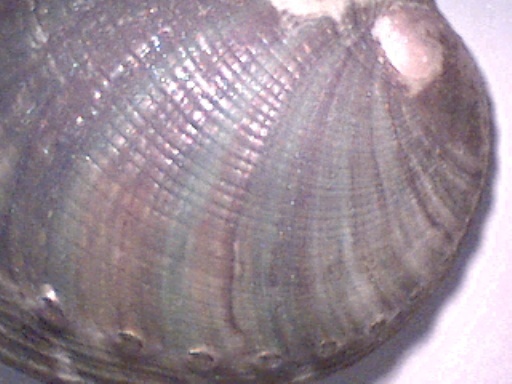 Similar Species: Common Ormer, Haliotis lamellosa (Mediterranean Sea only). Haliotis chump through vast quantities of macro-algae every night. At the moment Ulva (Sea Lettuce) seems to be their favourite but they also like Calliblepharis, Palmaria and Cryptopleura (all reds). A certain amount depends on what we can keep for a reasonable length of time in the tanks but most flat red or green algae seem suitable. Palmaria, the red seaweed that looks like a red Sea Lettuce is a favourite. The adult specimen fed extensively on microalgae. by Jenny Glanvill (Devon WWT). Juveniles eat microalgae, diatoms, bacterial film. Adults consume brown algae, including kelps, but will eat almost any seaweed. The sexes are separate and fertilisation is external. The larvae (trochophores) have a short life of only 5 or 6 days in the plankton, which does not favour a wide dispersal. It takes over 3 years for the mollusc to attain a breeding size of 40 mm. (Is this the wild growth rate?) Their life span does not exceed 6 years. This edible mollusc is well known from the Channel Islands. This is the northern limit of their distribution. They are found from the Mediterranean up the Atlantic coast of France and Portugal where they are commercially fished. Up to 12 cm long, Ormers are found in shallow water underneath weed-covered rocks and boulders. Their muscular foot allows them a remarkable turn of speed when they need to escape from a predator or inquisitive diver. For centuries ormers have been gathered by hand on the lowest spring tides, known locally as ormering tides, and are considered a great delicacy in the islands. Further information on Sue Daly's Channel Islands "Feature Creature on the Ormer". Click on the logo below to go to her site. Further information on the family Haliotidae is also found in the book "Living Marine Molluscs" from page 50. The rounded openings are used for the discharge of water from the mantle cavity after the oxygen has been extracted. (from the Student's Guide to the Seashore by J.D. & S. Fish). About half the holes near the mantle end are closed and not in use. A mystery animal discovered by Richard Huggett (Eastbourne) was originally identified incorrectly by Andy Horton as Haliotis tuberculata. It has now been found to be a foreign species but still an interesting discovery. This specimen (above) was found in a shell collection from Lancing, West Sussex, but it was probably brought back from abroad. The species has not been identified at the time of writing (16 January 2003). the Minquiers reef which is off the south coast of Jersey half way to St Malo, and only found one live ormer. All very, very depressing. As you have probably realised we are all very fond of ormers down here and proud to have them in our waters. They have been gathered by locals for centuries with ormering and ormer casserole a part of the island's heritage. Jersey's Environmental Services Unit and the Dept. of Agriculture and Fisheries are looking into the problem. The same thing happened this time last year along the French coast with a large proportion of their population dying out. It is also happening there again this year and they fear that those that survived last year will die this year. On a slightly brighter note - I was in Sark yesterday diving with some people from Guernsey and it seems that so far neither of these islands have been affected." The Ormer die off in Jersey is serious. An article in the Guernsey Press on 2 September 1999 said "that Jersey may close its ormer fishery this winter". The mortality is reported at 50 to 60%. I spoke to Grey Morel at Jersey Sea Fisheries. He said that this die-off started in Southern Brittany in 1997, reached northern Brittany in 1998, and now it is in Jersey in 1999.Guernsey is clear at the moment.An infectious agent has not been discovered. Jersey States (Government) discussed if the ban on fishing for ormers - Haliotis tuberculata should be lifted. This ban was put in place in 1999 when a mysterious virus (possibly caused by some sort of toxic algae , results have either not been found, or are yet to be made public) alledgedly killed many of the already overfished stocks in Jersey and France. The virus was found in France three years prior to Jersey and today it was reported that their stocks had recovered in France and the ban lifted there, although when I was in Brittany in November the ban was still in place in France, saying this several French fishermen where seen taking them in Jersey waters during the summer of 2001. Jersey stocks are reported as recovering slightly. Fishing for ormers takes place during the low spring tides that occur at the equinoxes, high pressure can make the tide draw about 2 feet more than predicted, and low pressure has the opposite affect (the tide actually pushes higher), fishermen go down to kelp covered boulders or reefs and mostly scour underneath the rocks with a long blunt hook, or turn over large boulders, there is an unwritten law that the boulders are always turned back to protect the marine life. Historical reports of ten tons being landed to the Jersey market and 30 tons being in the market come from the latter 19 century are reflected with personal catches before the ban being in 1999 being counted individually, a dozen per fisherman being the average or good ! The virus never reached Guernsey, which is said to be because the sea temperature is a degree or two cooler than the waters to the south. In 1673 an article was written "News from the Channel" referring to Sark it said ormers were eaten fresh or pickled, and it went on about the delights of this delicacy. In 1859 F.C. Lukis wrote about the use of shells as in furniture. in 1859 Jeffrey's writes "The principal use to which the shell now appears to be put to in the Channel Islands is to frighten away small birds from the standing corn, two or three of them being strung together and suspended from a stick so as to make a clatter when moved by the wind"
In 1923 T.A Stephenson carried out an investigation for the States. He stated that during the preceding 20 years catches had diminished from 10 to 14 dozen to only 3 dozen per head. At his suggestion ormering was suspended from 1924 to 1926. 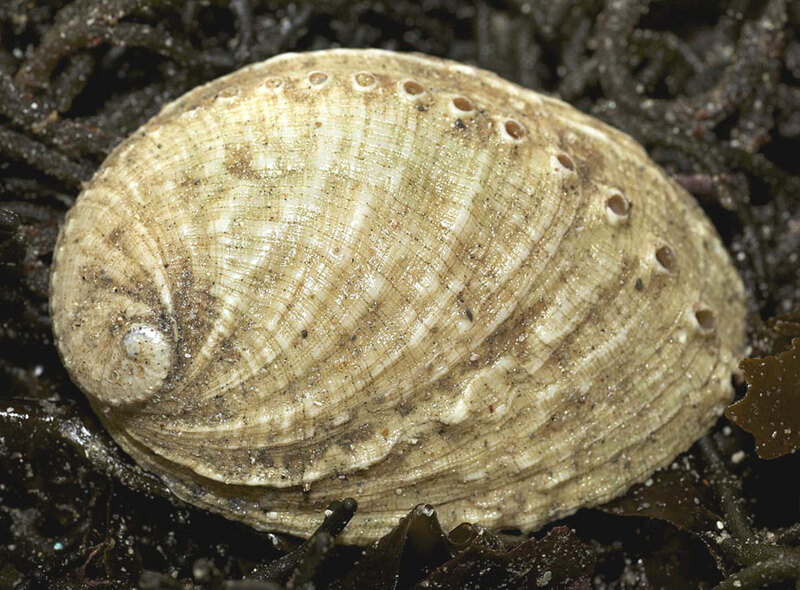 Jamie Le Tissier found a white-shelled Ormer, Haliotis tuberculata, at ELWS on the rocky promontory off Cobo, on the west coast of Guernsey. Richard Tostevin, a retired ormer aquaculturist, has never seen one and was very interested in the discovery. The mollusc is eaten in France and the Channel Isles. The rather tough flesh is first battered and tenderised before being fried. The flesh has an appealing sweet smell. Strict restrictions apply to the collection of this mollusc in the Channel Islands. < French regional (Jersey and Guernsey) ormer, variant of French ormeau (1563 in plural as hourmeaux ), either shortened < oreille de mer (although this is first attested later: 1611 in Cotgrave), or < an unattested post-classical Latin *auris maris sea-ear ( < auris shell (5th cent. ), spec. use of classical Latin auris ear (see auricle n.) + maris , genitive singular of mare sea: see mare n.4), with allusion to the shell's resemblance to an ear. 1637 E. Gregory & L. Dickenson Brit. Patent 101 (1857) 3 The saide arte or misterie of takeing away the outsides of the saide shells called ormers shells. 1672 Sir C. Lyttelton in Hatton Corr. (1878) 81 Ye ormers were thought most excellent meate. 1694 P. Falle Acct. Isle of Jersey ii. 74 We have also the Ormer, which is a Fish scarce known out of these Islands. Ormer?is a Contraction of Oreille de Mer.? It has no Under-shell like the Oyster, but the Fish clingeth to the Rock with the Back, and the Shell covers the Belly. 1955 Househ. Guide & Almanac (News of World) 283/1 The name ormer is probably a corruption of oreille-de-mer, the ‘ear of the sea’—and it certainly is a good description of the shape of the ormer's shell. Information wanted: Please send any records of this invertebrate, with location, date, who discovered it, how it was identified, prevalence, common name and any other details to Shorewatch Project EMail Glaucus@hotmail.com.